This Giclée features a carousel in a pastoral setting with horses coming to life, growing butterfly wings and taking flight. This piece originally came about as a commission piece for a large mural. We have an affinity for some of the idealized Americana style pieces of the early to mid 20th century. This piece follows in those footsteps while adding a new twist. 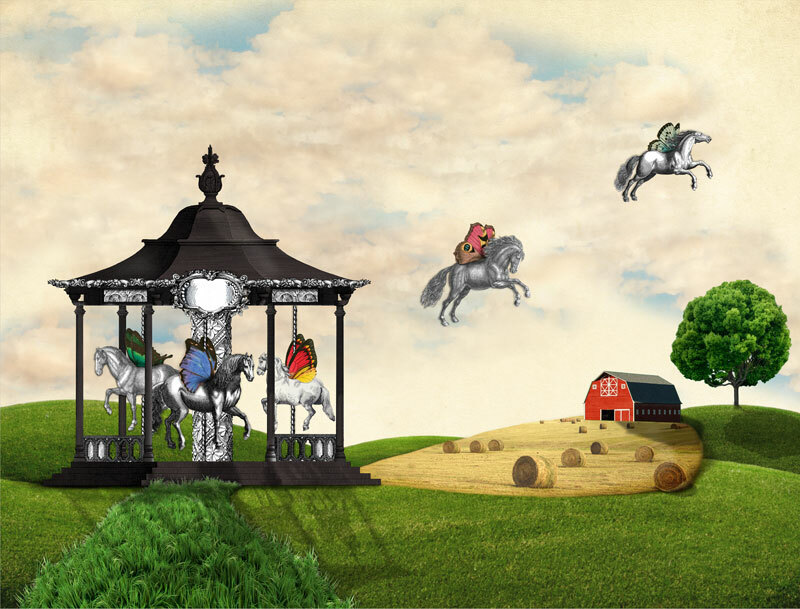 This mixed media collage is titled "Carousel Americana". The large poster sized prints are not currently available but they will be added back to the store in April. I am in the midst of getting my large printer worked on. Prints are available in two sizes: 8 x 10 (borderless) and 8.5 x 11 (with an approx. 1/2" white border). Both sizes are signed on the back. I use one of the finest and most archival pigment based inks available on the market. This ensures your print stays brilliant and fade-resistant over time. The paper I use for my prints is a heavy weight archival fine art paper. It is a matte paper that is 100% cotton rag, acid free and has just the most lovely soft, old fashioned and museum quality feel to it. This fine art paper not only has a beautiful richness but is also archival and fade-resistant. I take great care in my packaging to prevent your print from being bent or creased during shipping. My prints are shipped flat and well protected in an archival sleeve with a white chipboard backing,inside a bend proof mailer with an additional cardboard flat pad for extra assurance.